Scheduled Appointments: Although we will make every effort to remind you of your upcoming dental appointmnet by phone or by mail, you are ultimately responsible for remembering your appointment date and time. Confirming Appointments: We will call you at the number(s) you have provided us at least two days before your scheduled appointment to confirm that you still plan to keep the appointment. If we are not able to reach you because none of the telephone numbers you gave us are currently working, we will remove your appointment from the schedule since we were not able to confirm the appointment. If we reach your voicemail, we will leave a message requiring you to call us back no later than noon of the following day to confirm your intention to keep the appointment. If you fail to call us back, we will assume you are not keeping the appointment and will remove it from the schedule. Canceling Appointments: If you cannot make your scheduled appointment, you must call us at least 24 hours in advance to let us know so that we can offer your appointment to another patient. Failure to provide at least 24 hours notice counts as a missed appointment. Late Appointments: If you show up more than 10 minutes late for your scheduled appointment, we will remove your appointment from the schedule and this will be counted as a missed appointment. Missed Appointments: Because of the critical lack of access to dental services in our area, missed appointments are taken very seriously. If you miss one appointment, you will be documented as having missed an appointment. If you miss a second appointment without proper notice within the same calendar year, you will be placed on the "no-show status." If you wish to receive further dental care in our clinic, you will be required to call us the day you wish to receive care, and if we have any open appointments, we will be happy to place you in the schedule. If there are no openings that day, you will be advised to call the next day, and so on. Alternatively, we will be happy to place you on our "Quick Call" list, and we will call you when we have an unanticipated opening in the schedule. If you are able to make the appoinment that day, we will be happy to provide care. Please understand that if we make a same-day appointment for you and you fail to keep that appointment, you will be discharged from the practice. Please talk to any of the dental staff if you have questions about our No-Show Policy. 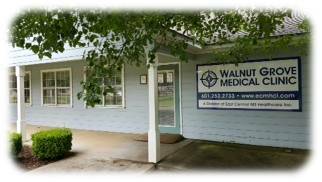 ECMHCI is extremely excited to announce that our Walnut Grove Medical Clinic has been approved as a Designated Hypertension Practice Center by the American Society of Hypertension. Only one other entity in Mississippi and seven nationwide have achieved this accomplishment. Congratulations to Dr. James Lock and the Walnut Grove Clinic Staff.